Something that has always made me uneasy, and in fact what has filled me with dread is the prospect of riding with others. This is reverse logic, given that horses are herd animals and therefore more likely to wig out when being ridden alone. If say, one horse stays calm, the others will also. This is why Deb Moore, when she rides, rides with no less than six other individuals. She loads them all into her very large trailer, and off they all go. off, 2) get nailed by a tree limb, 3) hit a hole stumble, and break innumerable horse and human bones, 4) go down in a bog. And let’s not forget #5 – a horse or horses could run into the road and get nailed by a car or truck. I have circumvented there kinds of thought by first riding alone, and then later riding with Pete. Pete’s a social guy and loves riding with others, so it has come to be that I have had to adapt. More and more we’ve been riding with others. If Signy was still around, I’d be riding Tinni, who used to be my default horse. But since she and Siggi are both no longer with us, Pete’s now riding Tinni. So I now have to ride Raudi when I ride with Pete. This is a good thing, for Raudi and I are both getting more experience in riding with others, and for this reason we are becoming more group savvy and confident. The past three rides are a case in point. The day before yesterday we did a bench ride with the Sihlers, going up the far side trail and coming down Pete’s trail. The Sihlers went up the trail faster than I expected – Raudi rocketed up behind Giff and Katla, not in her usual rocking horse canter, but rather in a full blown gallop. I was a bit fearful, for the terrain was a little slippery, but she just dug her hooves in and went for it. Then we stopped at the top and checked all the horses’ pulse. Tinni, who took his time, had the lowest pulse. The lesson that was learned by all is to let the old, wise horse set the pace. Raudi and I went first down Pete’s trail. This, going first down a steep trail, with other horses behind, was a major accomplishment for us both. I was at the ride’s conclusion both pleased and proud with how we did. However, the day was not yet over. In the evening my friend Heather came over with her horse Rio, and we opted to go for a ride. Once again, I wanted to ride Tinni. However, I figured that he needed a break, and so I instead rode Raudi. I was concerned because Rio has limited trail experience and thought he might at some point wig out. As it turned out, Rio was a real gentleman, and he stayed calm the entire time. The effect was synergistic – Heather became increasingly more confident, as did I. And Raudi walked, trotted, and cantered nicely the entire time. In addition, we worked on creek crossings, which also went well. The grande finale came when Rio stood quietly in what we call the puddle – a muddy wide creek at the base of a small hill. I had put Raudi on top of the near hill – she stood the entire time and watched the proceedings with great interest. Then today – Pete and I again rode with the Sihlers, this time on unfamiliar terrain. We met at Matanuska Lake and rode on the local trail system. I have to say that this ride was even more challenging than the above two; however, I had a wonderful time. Pete rode Tinni and ponied Hrimmi. And I rode Raudi, my number one riding horse. I started out behind everyone else. After a bit, she indicated to me that she wanted to be out front, by putting her ears back and pacing. So I asked and was given permission to go out front. 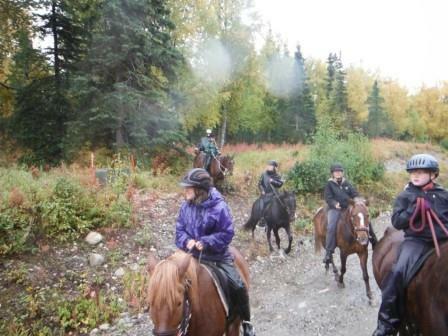 Good horse trail riding etiquette dictates that the one in front set a pace that the others are comfortable with. So I did this, repeatedly asking if it was okay to trot and canter. Raudi remained in control the entire time, and really enjoyed bounding up the small but steep hills. Putting her in front turned out to be a good thing to do, because she was able to blow off some steam. This also enabled her to remain calmer than she might actually have been when Katla (Claudia’s horse) became fractious. There were perhaps several reasons why Katla became fractious – it was buggy, she was no longer nursing a horse, and she’d maybe ingested some high sugar grass. However, Claudia did a really good job keeping her from taking off and running off into the sunset. Raudi did not (thankfully) seem the least bit concerned about the other chestnut Icelandic’s behavior. Towards the ride’s end, Raudi did start running out on some of the steeper hills. This was because I was starting to tire and not doing as good a job keeping my balance. However, we concluded the ride by going through the Palmer Experiment Farm’s open fields, me out front, Raudi on a loose rein, her head down, relaxed. I am, understandably, pleased with the progress that Raudi and I are making in riding with others. This is just yet another way in which we are together, moving forward.